Teaching, research and some admin staff in the old ‘pre-1992’ universities are poised to take a lengthy 14 days of strike action over 4 weeks in February and March, and an extended period of ‘action short of a strike’ up to June 2018, against proposed drastic changes to the University Superannuation Scheme (USS). The proposals would see workers’ retirement income thrown to the wolves with an estimated loss of £10,000 a year of pension on average. Similar to that seen elsewhere in the public sector, pensions have been eroded in higher and further education for some years. Education workers have already seen their pension scheme change from ‘final salary’ to ‘career average’ in 2011 which was supposed to ensure long-term stability in the face of a projected deficit. However there remained some security in the knowledge of a predictable ‘defined benefit’ (known payout) at retirement whereas the proposed alternative of ‘defined contribution’ would essentially make each worker an investor in their own future, subject to the usual stocks and shares uncertainty. The USS is peculiar in that it isn’t underwritten by the government and also has its dozen board members made up of individuals from the University of Colleges Union (UCU), bosses represented through Universities UK and various ‘independents’. The UCU members, in a minority on the board, had fought the previous changes to the scheme but were threatened with court action for stalling and the change to career average were eventually passed, which has given confidence to employers to push for the new investment model. At the same time, the UCU has highlighted the huge increase in surplus by employer institutions which is being used for expansion (competing with other universities), while staff costs have been kept down by various measures including performance schemes and below inflation pay deals. 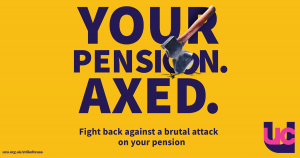 The union is calling on employers to put more into the pensions scheme as well as government support. It is all the more galling that one of the current USS board members is the same vice-chancellor (V-C) of Bath University, Glynis Breakwell, who resigned after criticism of her excessive £468,000 annual pay. It has since emerged that 95% of V-Cs sit on (or are entitled to attend) remuneration committees which set their pay and perks such as company cars and union research previously showed the average pay for V-Cs had risen hugely to £278,000 in 2015-16. The industrial action is being supported by the National Union of Students (NUS) who see that students are being disadvantaged both by high student fees and the prospect of unhappy lecturers. The NUS has instructed members to complain to V-Cs and attend demos and not to attend lectures on strike days if other staff are working and to join picket lines. The NUS and UCU signed a joint statement challenging the marketisation of education, casualisation which is rife in higher education, and the bloating of V-C pay. Students are also asking for money back from the university for the lost teaching time. 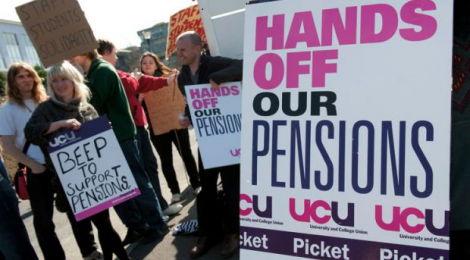 The other two main unions at universities Unison and UNITE have also stated their support. Staff moving roles within institution would find themselves worse off in the proposed USS scheme. Equally this would apply to workers moving from a post-92 institution into an older university. Of course the private sector has also been criticised for excessive pay (some with multi-million pound salaries) and pensions scandals have seen pensions of workers all but disappear such as with Next and most recently Carillion, where bosses were likewise receiving vast salaries and protected benefits even in the face of a company’s collapse. It’s clear that the scourges of inequality and insecurity will not disappear without a major restructuring of society but any intensification of industrial action and acts of solidarity such as we are seeing in the universities is to be encouraged and supported by revolutionaries.